One Eternal Day: "Good for nothing but reading"
.... In the age of print the Bible would be divided into numbered verses, indexed, cross-referenced, glossed, and annotated. The Protestant ideal held that Scripture was self-interpreting, and to help it along in that regard, a host of study helps and apparatuses were born, encouraging the reader to make parallel connections, to grasp in the literature of generations the grand unity of a single divine author. Most of these features existed before the printing press. 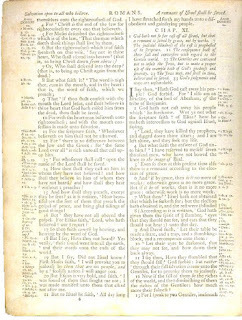 Successive print editions simply refined and expanded the apparatuses to the point that the text was rarely experienced without them, rendering the Bible perhaps the most technologically advanced book in the predigital world. 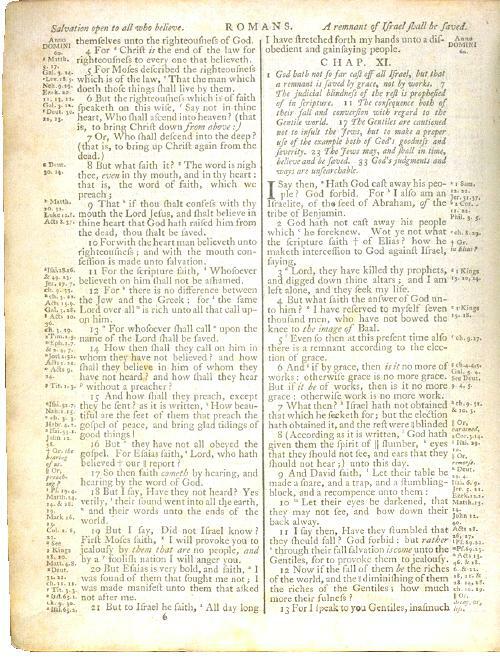 From its inception, the print Bible aspired toward what we would now recognize as hypertext. Over the centuries a format for such books has emerged, familiar to us all thanks to its near-universal adoption in fiction and nonfiction. Whether you're reading a novel or a work of history, a short story collection or an anthology of theological essays, the book is designed with a single column of text on each page set with a balanced preparation between the column's width and the size of the type. Bibles usually don't look this way. They are designed like dictionaries, or shrunken newspapers, the kind of text you're more likely to dip into than to lose yourself in. A designer who wants to make the Bible reader-friendly simply has to take her cues from the kind of books we read deeply. Setting the Bible in a single column per page instead of two, removing all the headings and subheadings that have been inserted over time, along with the cross-references, the red letters, the superscript numbers and letters throughout the text, and even the verse numbers, results in a book that's really good for nothing but reading.